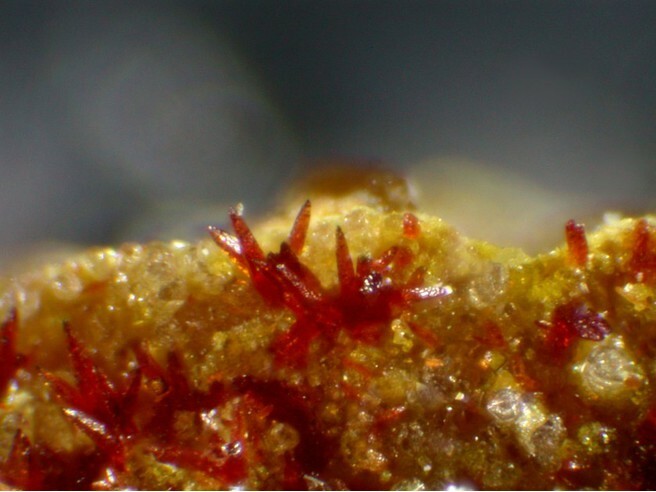 Mawbyite: Mineral information, data and localities. Named in 1989 by Allan Pring E. Maud McBriar and William Birch in honor of Sir Maurice Alan Edgar Mawby (August 31, 1904, Broken Hill, Austalia - August 4, 1977, East Melbourne, Australia) for his contribution to the Australian mining industry and expertise in the minerals from Broken Hill. He was a metallurgist and mining executive. He identified 17 species from Broken Hill that had not previously been reported from there. He was knighted in 1963. The monoclinic dimorph of Carminite. May be confused with arsenbrackebuschite, also a Pb-Fe-arsenate, but which a much higher Pb content. Oxidized granular spessartine-quartz rock in a zone of several cubic meters. Segnitite 3 photos of Mawbyite associated with Segnitite on mindat.org. 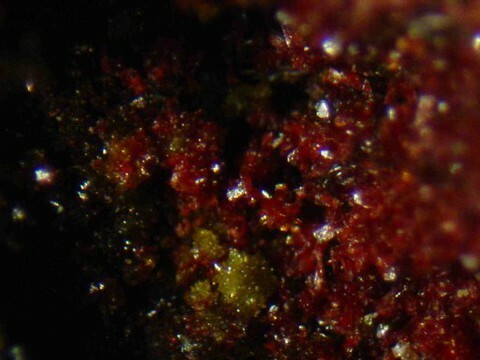 Mimetite 3 photos of Mawbyite associated with Mimetite on mindat.org. Duftite 1 photo of Mawbyite associated with Duftite on mindat.org. Adamite 1 photo of Mawbyite associated with Adamite on mindat.org. Beudantite-Segnitite Series 1 photo of Mawbyite associated with Beudantite-Segnitite Series on mindat.org. Pring, A., McBriar, E.M., Birch, W.D. 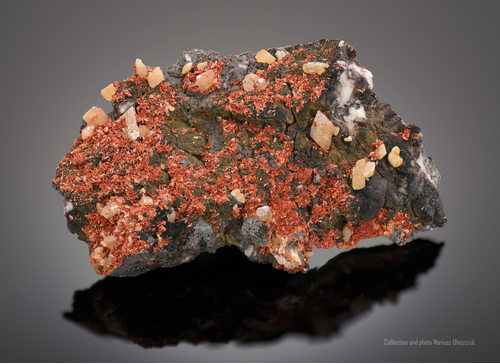 (1989) Mawbyite, a new arsenate of lead and iron related to tsumcorite and carminite, from Broken Hill, New South Wales. : American Mineralogist: 74: 1377-1381. Kharisun, T.M.R., Bevan, D.J.M., Rae, A.D., Pring, A. (1997) The crystal structure of mawbyite, PbFe2(AsO4)2(OH)2. Mineralogical Magazine: 61: 685-691. Krause, W., Belendorff, K., Bernhardt, H.J., McCammon, C.A., Effenberger, H., Mikenda, W. (1998) Crystal chemistry of the tsumcorite-group minerals. New data on ferrilotharmeyerite, tsumcorite, thometzekite, mounanaite, helmutwinklerite, and a redefinition of gartrellite. European Journal of Mineralogy: 10: 179-206. Walenta, K. (1992): Die Mineralien des Schwarzwaldes. Chr. Weise Verlag, München, 336 pp. (in German); Blaß, G. & Graf, H. W. (1997): Neufunde von bekannten Fundorten (19. Folge). - Mineralien-Welt, 8 (5), 32-36. XRD and EDS confirmed by Terry Seward.